The Cerberus breakers are weird, in that they look like a suite but they really aren't worth the influence to play as one. Lady is a badass, but Rex and Cuj.0 can only really be considered in their own faction. Taken in that light, Rex is actually a pretty good addition to the criminal breaker suite. If influence is tight, Rex alongside Passport can act as a not-too-awful Decoder solution. Passport does the heavy lifting on centrals, Rex steps in when there's a remote to be cracked. As @Greasythumb said, "Rex" is most useful in faction and might not worth the influence cost to splash it. But, is it really useful for Criminals? This faction also have Peacock; not a great icebreaker, but in many way comparable to "Rex". Both cost 3, but Peacock have one more strength. Peacock cost 2 to boost strength by 3: so it's more efficient but less flexible than "Rex". But, Peacock can be used on the long term while "Rex" only have a maximum of four uses. So yes, in faction, it's a good choice if you lack influence for something better. But you must have a plan for the long term. And please, don't waste influence to get shaper cards for "Rex" recursion when this influence could have bought a better decoder. 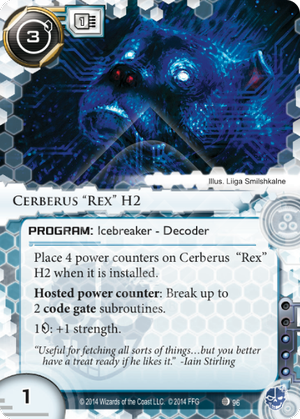 I find that Rex can fit a niche quite well in criminal decks as a cheap backup decoder, very similar to Faerie. It costs 3 more to install than Faerie but you will be able to use it at least once more than a copy of Faerie so I think that the install cost balances out. For example you might be using Yog.0 aided by Datasucker as your deck's main decoder, but you could put one or two copies of Rex in your deck to cover you for scenarios where you are low on Datasucker counters or your Yog.0 ends up being trashed by the corp. As others have said, the influence cost is way too high to use it in non-criminal decks.